Giving a gift in a pretty box, is almost like giving two gifts. A gift box can be used to store all manner of things – jewellery, craft supplies, and other treasures. We love the effect from using a white box with a patterned, fabric lid. A fabric covered, padded lid is quick to make, and you can customise the fabric to suit the recipient. In this gift box, we have used some Old New 30’s fabric by Lecien that we bought on our recent trip to Japan. It is a pretty print with a nice weight and texture. The white gift box was purchased at a craft store. 1. Cut quilt batting so that it measures the same dimensions as the box, 3 x 3 inches. We used two layers of quilt batting for the padded lid. Cut a piece of quilting cotton, measuring 6 1/2 x 6 1/2 inches. Cut 1 1/2 inch squares from each of the corners. 2. Glue the quilt batting to the top of the lid. If you are using two layers, glue the layers together first. Apply glue to the inside of the box lid. Adhere the fabric and clip in place while the glue dries. 3.There will be a little bit of fabric (1/4 inch) that will protrude from the lid corners. Glue this fabric around onto the opposing side and allow to dry. Fold approx 1/4 inch in on the remaining two sides so that you get a nice neat corner. 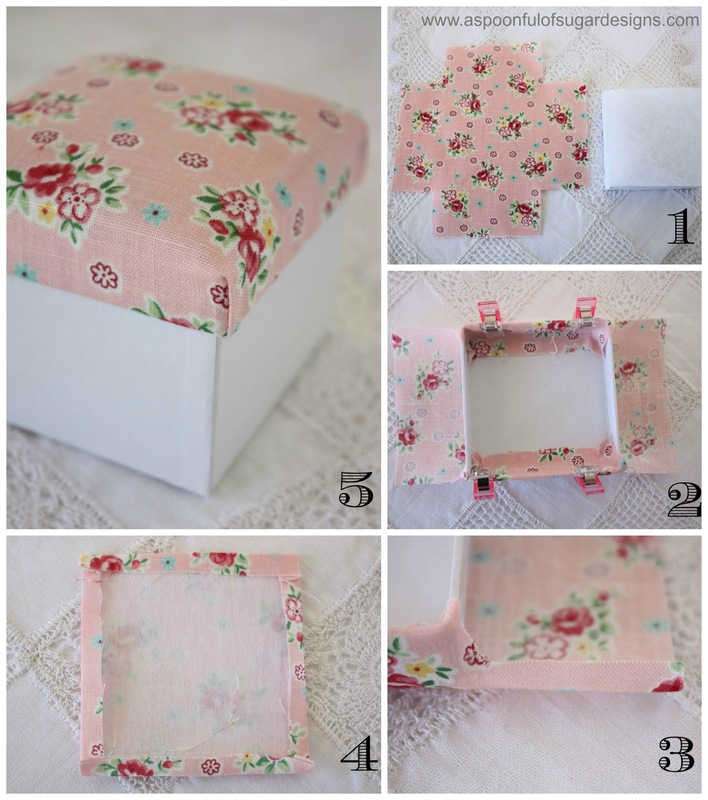 Glue the sides of fabric in place on the inside of the box lid. Allow to dry. 4. Cut a piece of heavy fusible interfacing that is slightly smaller than the box lid. (2 7/8 x 2 7/8). Cut a square of fabric that is 3 1/2 x 3 1/2. Centre the interfacing on the wrong side of the fabric square and fuse in place with an iron. Press the remaining fabric down as shown in photo 4. Glue the fabric square to the underside of the lid to hide all the raw edges and make the underside of the box neat. (as shown in photo above). You could make a Fabric Covered Gift Box for any holiday or occasion – Easter, Christmas, Birthday, Mother’s Day etc. Just use fabric to suit. Beautiful! Now, I just need to get my husband to shop at Tiffany’s for me! Preciosa ,me gusta ,un saludo. It’s is like giving a gift inside a gift 🙂 I love this!! The fabric is adorable!! Very cute box idea! It would make an adorable jewelry box for my girls and nieces. So super cute! I would keep that box on a dresser or table. Thanks for the tutorial! I love your creativity together with being a mother and daughter team. I am a fabric freak and you make beautiful items. Thanks so much Karen for your sweet message 🙂 Have a wonderful weekend – with plenty of sewing time! Hi, I’m trying to get the same material. Can you help me? I don’t have the fabric number. I’ve been looking thru lecien and can’t find the same one. Anything you could do would be greatly appreciated. Thank you! Pauline I want the same one as on your fabric covered box. Hi Pauline I bought that fabric a few years ago when I was in Japan and it was out of print at that time. I have done a search but can’t find any for you. It was Old New 30’s by Atsuko Matsuyama for Lecien Fabrics. If you keep checking on Etsy some may turn up. 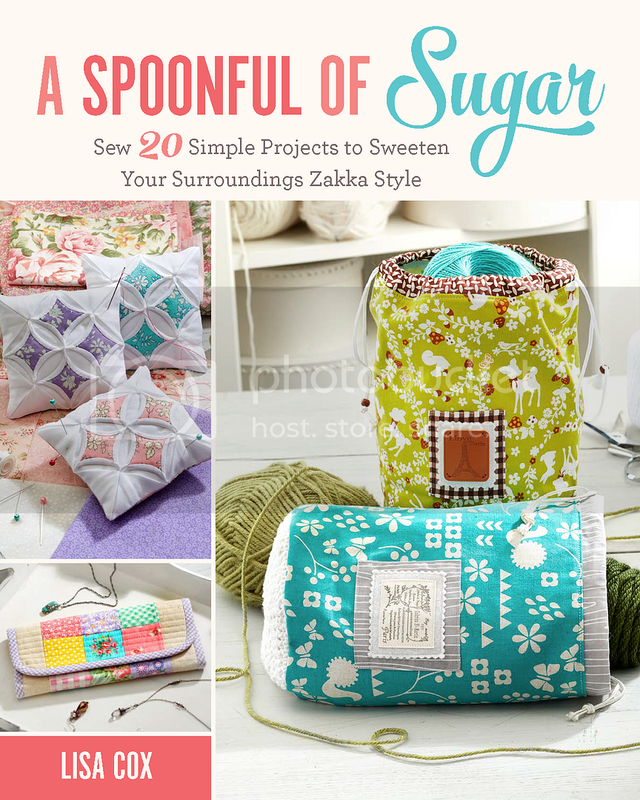 Otherwise there are other Old new 30’s fabrics that are equally sweet. Thank you . Pauline The box is adorable.